Jesse Matthew is expected in Albemarle County Circuit Court, for a noon pretrial hearing in the Hannah Graham murder case. Very little is known about what topics will be argued, since the defense and prosecutors have successfully requested many motions remain sealed until discussed in open court. WTOP's Neal Augenstein will be in the courtroom. Bookmark this page for up-to-the-minute details. 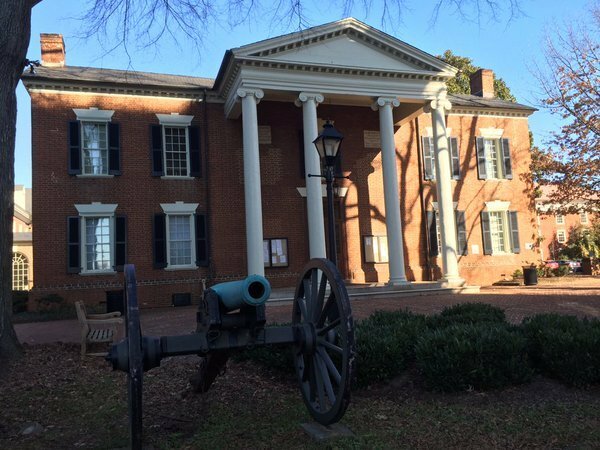 CHARLOTTESVILLE, Va. -- Jesse Matthew is expected in Albemarle County Circuit Court, for a 12 noon pretrial hearing in the Hannah Graham murder case. Very little is known about what topics will be argued, since defense attorneys and prosecutors have successfully requested many motions remain sealed until discussed in open court. WTOP's Neal Augenstein will be in the courtroom. Bookmark this page for up-to-the-minute details. Incoming Commonwealth's Attorney Robert Tracci will be at #JesseMatthew pretrial hearing. Unclear if he'll be at prosecutor's table. It's not clear what will happen at #JesseMatthew noon hearing. Earlier, defense and pros got Motions sealed, until argued in court. Prosecutor Denise Lunsford will turn over #JesseMatthew cases to Robert Tracci when he's sworn in Jan 1. Gil Harrington, mother of #MorganHarrington enters courthouse. Today's hearing is re #HannahGraham . Heading into courtroom shortly for noon pretrial hearing in #JesseMatthew murder case for #HannahGraham death. Incoming prosecutor Robert Tracci sat down in second row, behind defense table. Jesse Matthew's sister and girlfriend sat in the same row, a few seats away. They didn't address each other -- they likely didn't know who each were. When defense attorneys Doug Ramseur and Michael Hemenway sat in front row, Tracci left the courtroom. Introduced myself to Tracci in hallway. He'll take over the case Jan 1, 2016, when he's sworn in. Lawyers for #JesseMatthew give first suggestion of insanity defense by asking for mental health expert, since Jim Camblos asked in Fairfax. Prosecutor suggested def was trying to delay testimony of sick Albemarle Co detective until too ill to testify. Defense took offense. 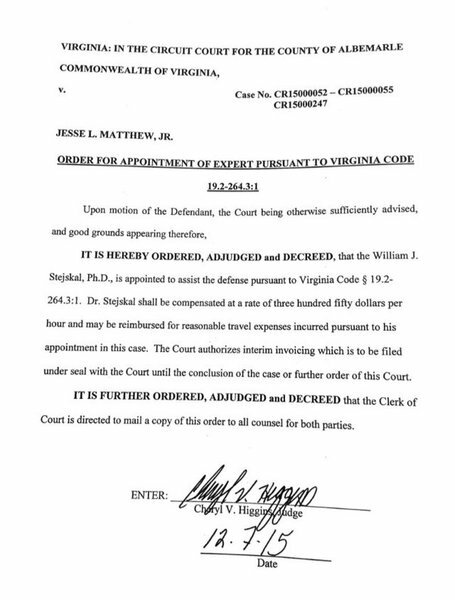 #JesseMatthew mental health expert psychologist William Stejskal diagnosed Charles Severance w a form of schizophrenia. NEW YORK (AP) _ GOP presidential candidate Donald Trump calls for "complete shutdown'' of Muslims entering US.